Get started by using these resources to engage your community. Sign up for the Sewage-Free Streets and Rivers newsletter for the latest resources and updates on CSO developments. Use this sample email text to invite community organizations in CSO communities to join the campaign. Download this one-pager on the Sewage-Free Streets and Rivers campaign. Step one: Learn about combined sewer overflows in New Jersey. The New Jersey Department of Environmental Protection has a website devoted to the combined sewer overflow permit. Find resources on the permit and a map of combined sewer overflows in New Jersey. The CSO fact sheet gives an overview of New Jersey’s cities and towns with combined sewer systems and lists all of the CSO permit holders. It shows how the regional permits are organized. It also includes links to reports and background on the Clean Water Act and Combined Sewer Overflow Permit. Notification system for the City of Bayonne, Borough of East Newark, City of Elizabeth, Borough of Fort Lee, Town of Guttenberg, City of Hackensack, Town of Harrison, Jersey City MUA, Town of Kearny, City of Newark, North Bergen MUA – Central, North Bergen MUA – Woodcliff, City of Paterson, City of Perth Amboy, Village of Ridgefield Park. Step two: Connect with local groups, community members and your municipality or utility. Municipal action teams – Groups like Newark DIG, Camden SMART and Paterson SMART have been working in communities with combined sewer systems to reduce flooding and sewage overflows and find green solutions. Learn if there is a Municipal Action Team in your community here. Step three: Share information with your neighbors, community groups, and elected officials. Use this action guide to get the word out about what residents, elected officials, community-based organizations, and small businesses can do to ensure that combined sewer overflow plans include community preferences. 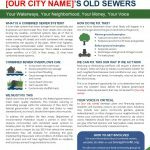 This set of two flyer templates is designed for use by residents, local organizations, and anyone else interested in educating the general public on combined sewer overflows, flooding, and CSO solutions. Any type in red can be customized to a specific city. Spanish and Portuguese versions and additional translations are available upon request. New Jersey’s combined sewer overflow permit holders are required to submit a series of reports as part of the development of their plans, known as Long Term Control Plans, to reduce combined sewer overflows. The next report, due on July 1, 2019, is the Development and Evaluation of Alternatives Report. This document defines the alternatives being evaluated and questions to ask the permit holders about the CSO evaluation of alternatives. Step four: Organize a local workshop or survey your community to get more people in your community engaged and involved. Contact the Sewage-Free Streets and Rivers campaign at info@sewagefreenj.org for support in organizing a workshop and/or assistance in developing a community survey. Download the Sewage-Free Streets Rivers presentation for community meetings and events. Summary: The Sewage-Free Streets and Rivers campaign seeks to fund partner organizations to conduct public outreach and education in targeted communities to educate families and small businesses on the impacts of combined sewer overflows, opportunities for community input in the development of solutions, and the benefits of green infrastructure. What is your municipality or utility doing to address sewage overflows? The Clean Waterways, Healthy Neighborhoods initiative is a collaboration of the entities that own and operate combined sewer systems within the Passaic Valley Sewerage Commission (PVSC) and North Bergen Municipal Utilities Authority (NBMUA) service areas. This report was developed by a Rutgers University team led by Daniel J. Van Abs Ph.D. PP AICP. It focuses on the 21 New Jersey municipalities that have combined sewer systems and examines issues regarding water supply and wastewater capacity for these municipalities. The Water and Sewer System Ownership and Management Map gives a detailed review of water and sewer system ownership and management, including collection systems and treatment plants, in New Jersey CSO municipalities.